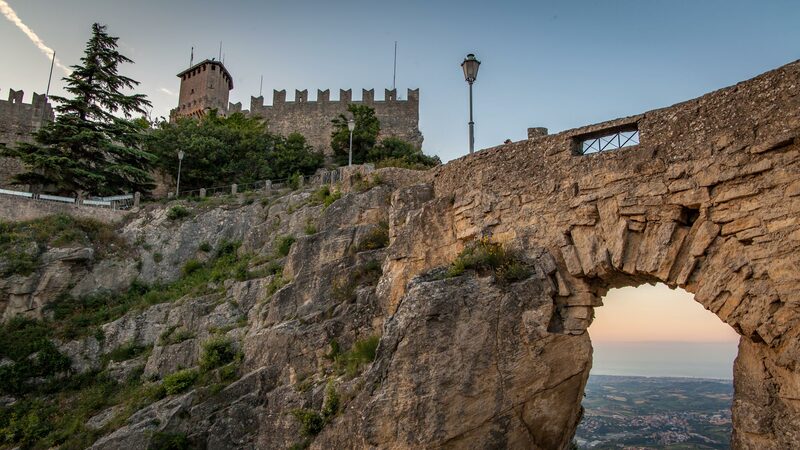 For such a minuscule country, San Marino provides a fascinating collection of unique facts, outstanding views and an impressive history. 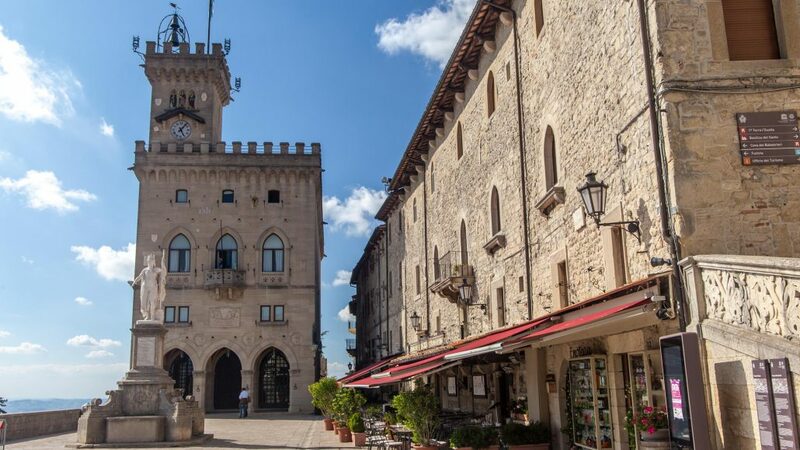 Given its size though, many people opt to take just a day trip to San Marino from one of it’s neighbouring Italian cities and not spend a night or more getting to know it. 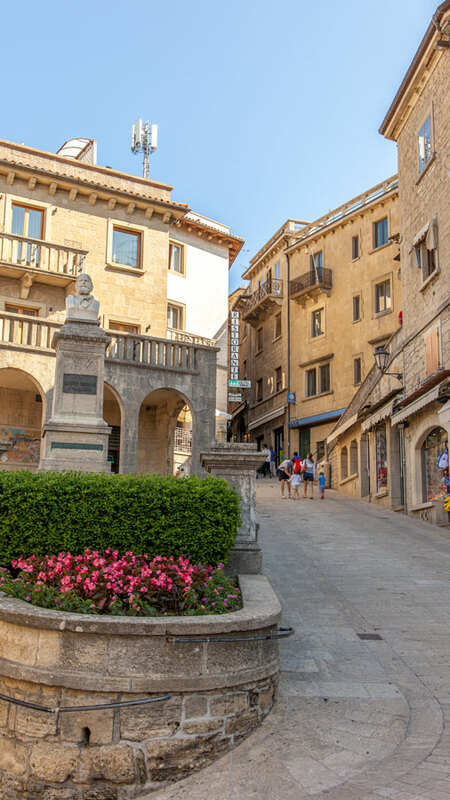 As the fifth smallest country in the world, and surrounded by Italy, it’s easy to see how San Marino could merely be a novelty country tick while travelling around the Emilia Romagna region of Italy. But I for one think that this micro-state deserves at least one night of your vacation. 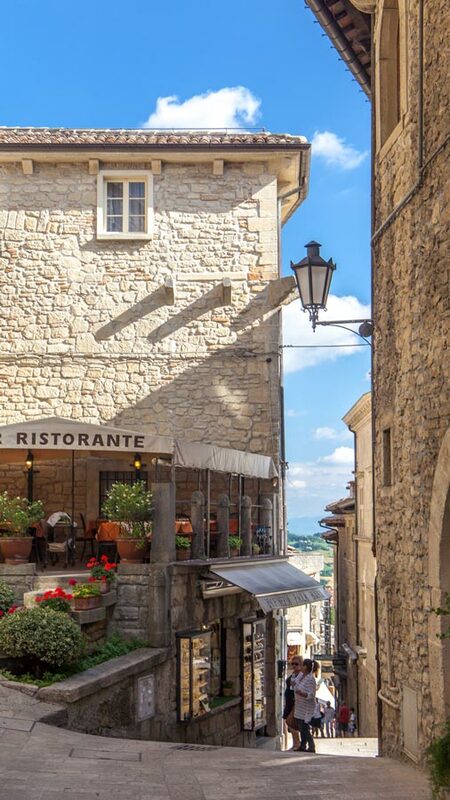 Overnight or day trip to San Marino? 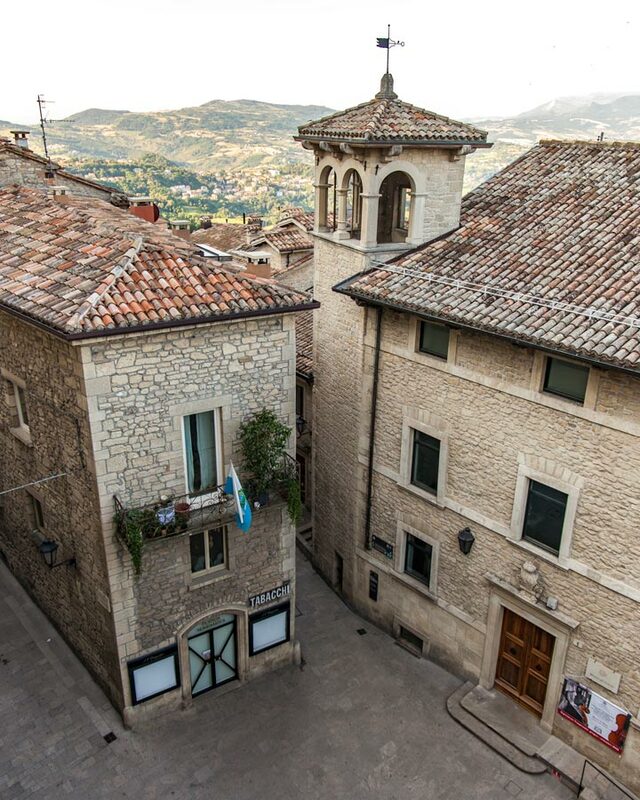 San Marino is more extensive than most people would assume, given the old town of the nation, with its three towers perched on the hill, gets most of the attention. But further down from the towering position on Monte Titano there are actually other towns and spots to visit, though none really have the charm or draw of the historical section. 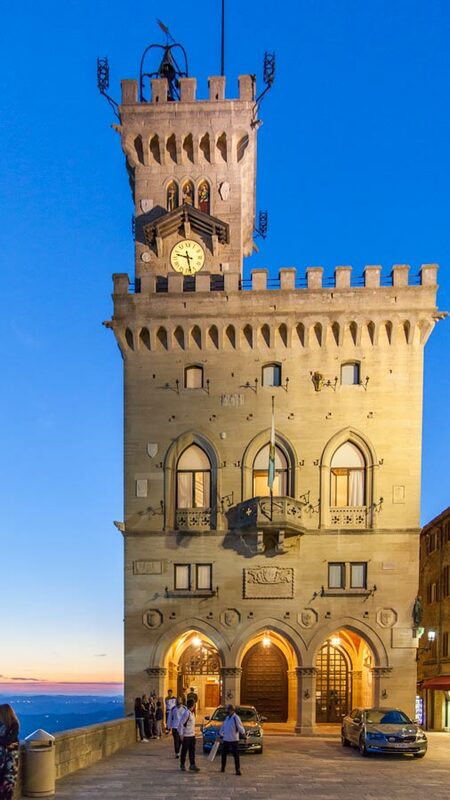 The real reason I think you shouldn’t take a day trip to San Marino but stay overnight is because of how magical it becomes once the sun starts to set. With a stunning vantage point over-looking Italy, the ocean, and on a clear day as far as Croatia, the sunsets here are mesmerising, especially as a backdrop to one of the three towers that flank the mountain. 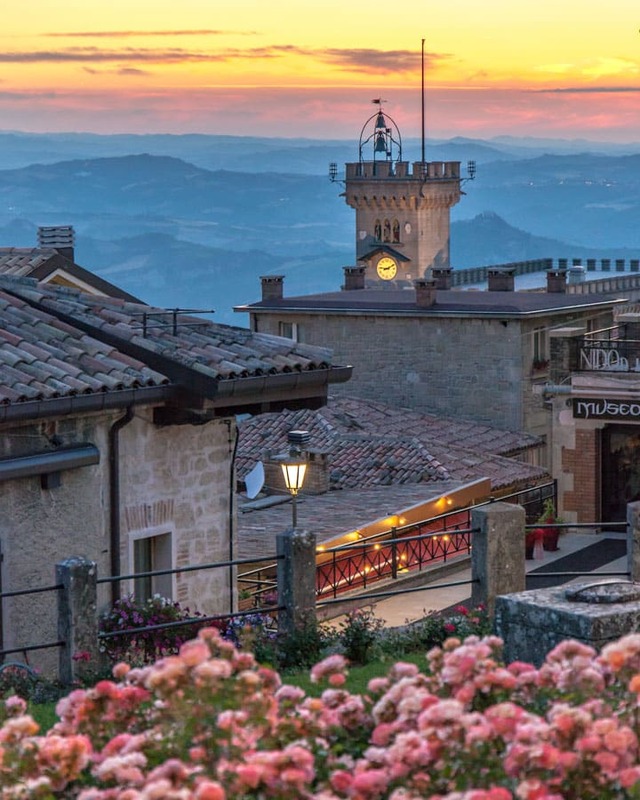 But more than just the sunsets make an overnight stay in San Marino attractive; I found once the day-trippers left a sense of serene charm set across the historic old town. With sandstone streets quickly became devoid of crowds and the real magic of this micro-state was revealed. 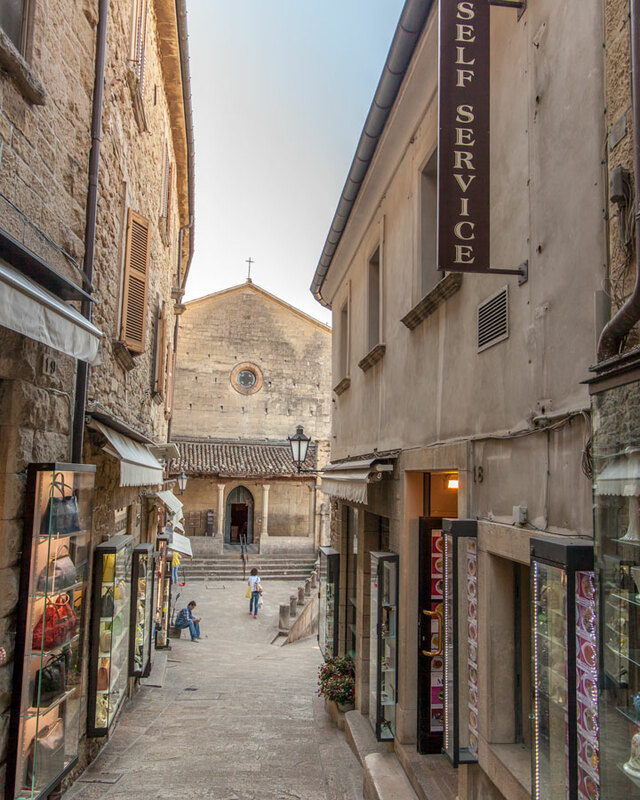 With only around 1000 beds for tourists to stay over-night here, and no cars and few residents, by evening San Marino feels like you have wholly stepped back in time. Delicious dinners with breathtaking views, ample architectural and design wonders, and a peaceful feeling of being on top of the world transport you far away from the group-tours and naff novelty shops that seem to rule supreme in the day. I stayed at the Hotel Titano which was rather grand and had a fantastic view from its restaurant. My room was on the lower floor, and the quality of the room and views weren’t as good as my friends Janet who had a refurbished room higher up, so if you do book in here request to have a higher, newer room. How to get to San Marino? 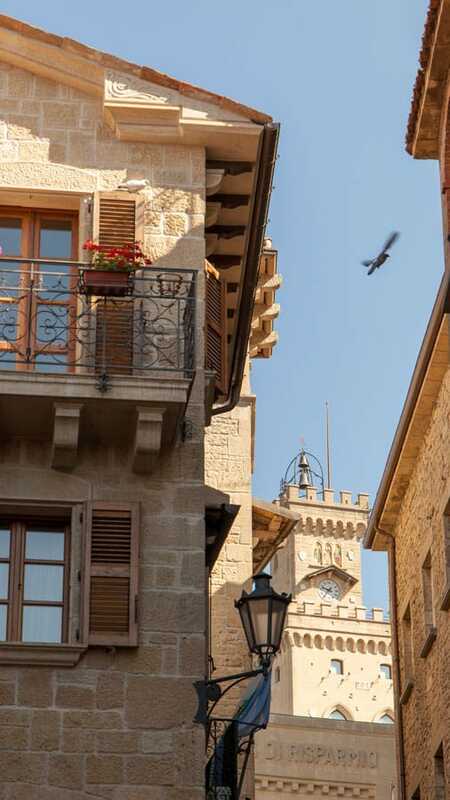 Whether you are planning to visit San Marino on a day trip, or to stay overnight, your routes will likely be the same. 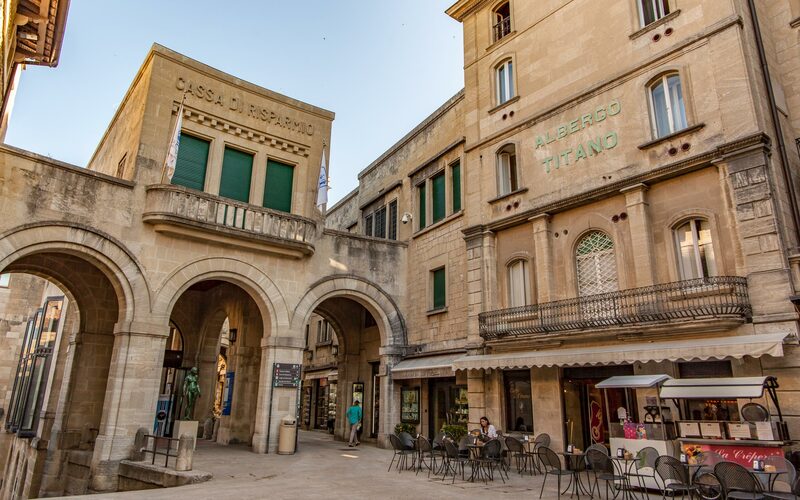 If you are self-driving then this will likely be the easiest way, and although cars are not allowed in the historic centre itself there are some car-parks both nearby, and others further afield with buses to get you to the old town. It’s best to discuss parking options with your accommodation and heed their suggestions, especially if coming in the peak tourist months as parking isn’t exactly unlimited. 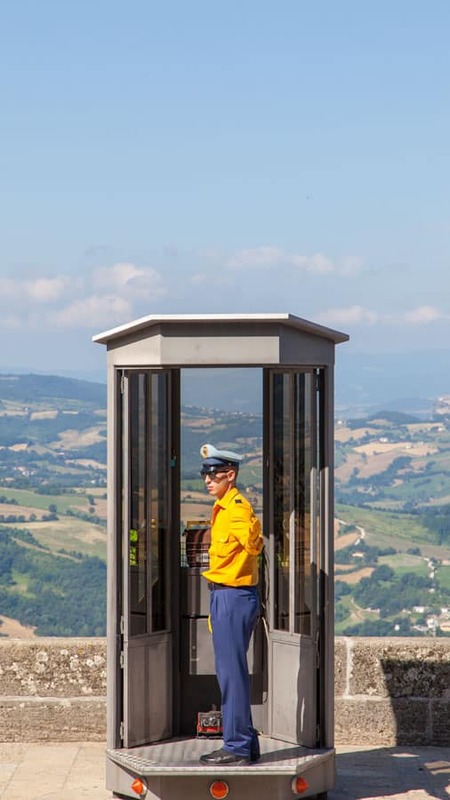 As such, I’d suggest making the most of the great public transport links to get you too and from San Marino and although the buses will take you right to the top, hop out a stop earlier to take the cable car for an extra vantage point of rising to the top of Monte Titano. 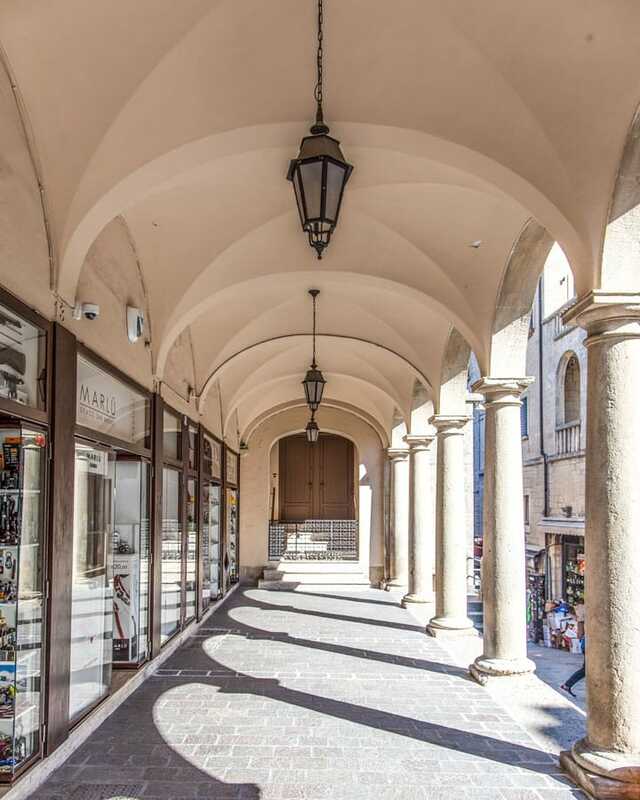 The coastal city of Rimini in Emilia Romagna is your best connection to San Marino given its ample parking, train and air connections. From here you can take a bus to San Marino in under an hour and for around 10 Euro. The buses leave from outside Rimini train station, so you can quickly arrive here from other cities in Italy. A direct bus service from Bologna airport also connects to Rimini Station, and from here you can transfer onto the San Marino bus. Two companies operate the San Marino bus route, and the timetable varies between summer and winter. 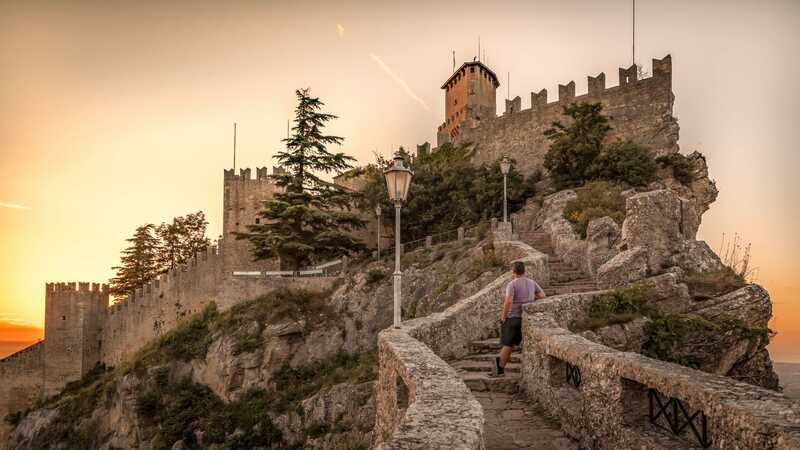 The option of taking a coach day trip might appeal more to those who want to visit from other parts of Italy and avoid the connections in Rimini, though if you plan to have an overnight stay in San Marino then taking the bus I believe is your best option… but why visit San Marino anyway? If you haven’t taken a look at the video at the top of this post, check it out and I’ll take you on a timelapse walk around the beautiful old part of San Marino and then read on for some more about this fascinating country. I’ve been to quite a few of the micro-states in Europe, and usually, within half a day I’m ready to move on. In San Marino, though I was captivated by both the unique facts of the country, ranging from its calendar to its government, but also the beauty of the landscape and architecture. As a photographer, I enjoyed my time here, and with so many different angles and lookouts, you can marvel out or in at the unique location on Monte Titano. 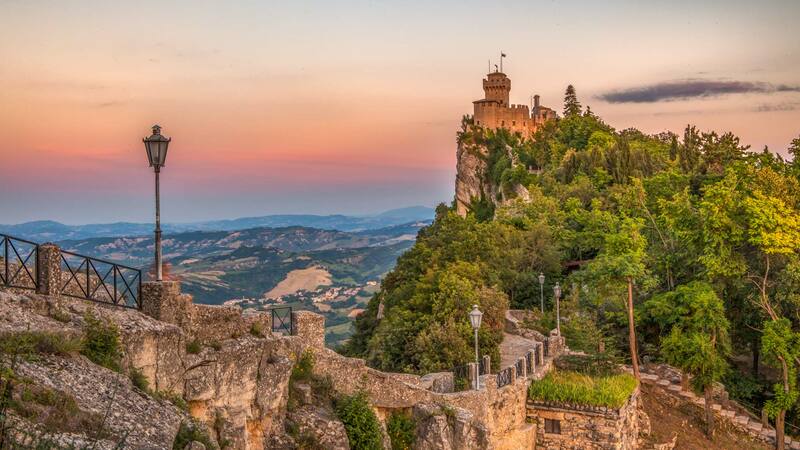 Here are a few reasons you should visit San Marino. Now, if that’s not worth visiting for some bragging rights, I don’t know what is? But seriously, small countries can sometimes be more of a novelty than an exciting visit but San Marino bucks the trend due to some of its unique facts. You can get a passport stamp here, the postage stamps of the country given its size are worth a handsome chunk with collectors and, uniquely given in the old town you won’t see cars, the number of vehicles in the country outnumber people. 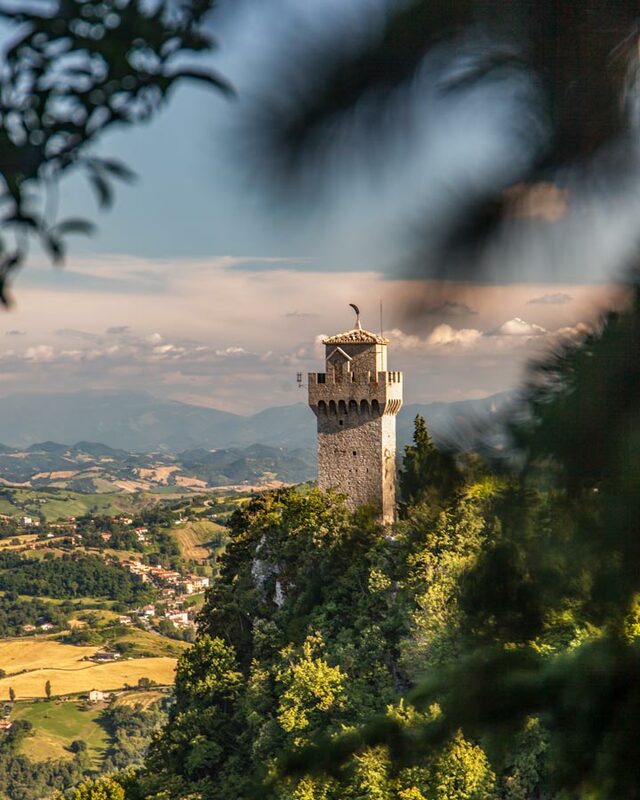 The three towers of San Marino are the postcard-perfect images most associated with the republic, and the views from these over the surrounding landscape are impressive. But the actual towers themselves provide beautiful visuals thanks to their placement and construction and the paths between them take you on a walk across much of the old town. San Marino was founded in A.D. 301 by a stonemason, Marinus, thus making it one of, if not the oldest constitutional republics in the world. The country stayed neutral through two world wars, turned down Napoleon’s offer to help the country expand its landmass and is devoid of any official religion, with state and church wholly separated and even the main church in the country is used for non-religious meetings and purposes. 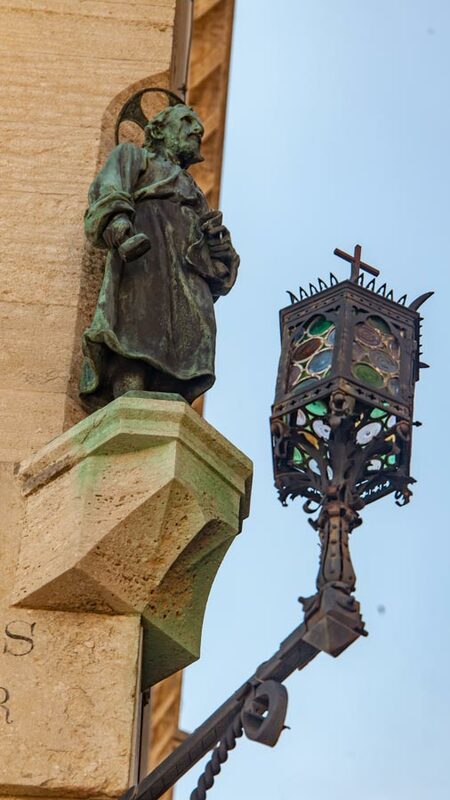 I highly recommend joining a walking tour in San Marino to learn more of its history. Another quirky fact about the country is they have two calendars, and while walking around you’ll often see two different years/dates on certain things. This is because the countries official calendar began on the day the republic was founded in A.D. 301. San Marino as a republic and a firm believer in Liberty, has one of the most different parliament setups in the world. There are always two presidents at any time from different partys, and the term only runs for six months. This allows there to always be new voices and open discussions around any laws and help represent a more significant number of people without having one single party or leader. The presidential cars can often be seen parked outside of the parliament building on the square and although a driver and car are assigned to the president while in office, on the last day they lose the car and have to walk or find their own way home, to show the returning to a normal citizen. The people of San Marino are indeed not Italian but are known as Sammarinese. Within a short time in the Republic you’ll pick up on the sense of pride its citizens have, and given its size, it’s impressive that local wines and goods are produced here, though most products end up being exported to Italy due to the small population size. 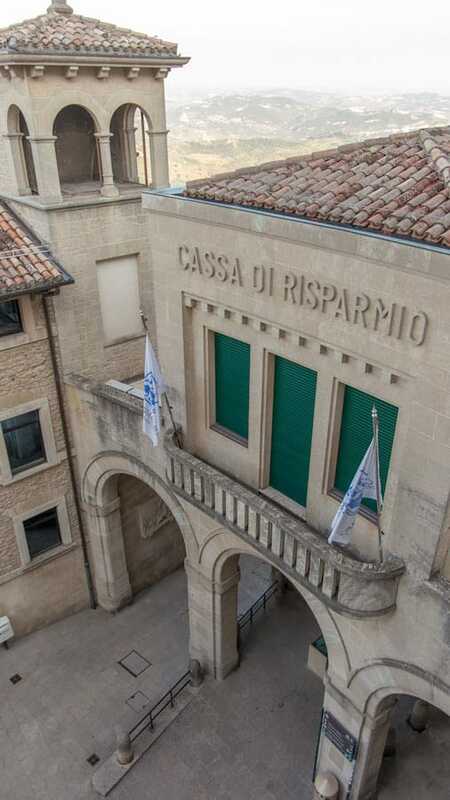 If you love a good museum, then San Marino has some unique ones for you to pick from with a collection of over ten. From the Museum of Torture, which is self-explaining, to the museum of Curisities which houses a bizzare collection and has no real relation to San Marino, the small museums are good for a rainy day. 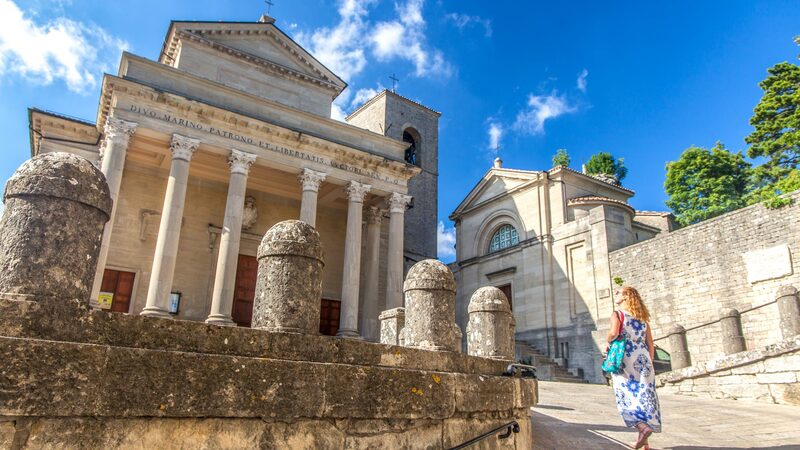 With more traditional art or weapon museums on offer too, most often it’s actually the stunning architecture of the old San Marino buildings that make it worth the ticket price. If you plan to visit a couple then look into the San Marino card for a discount. Given the tiny population of San Marino, it’s no surprise their football team have never qualified for the Euros, but the national sport here is actually Crossbow, and you can watch it occasionally in the minuscule national stadium which is set up for this sport. 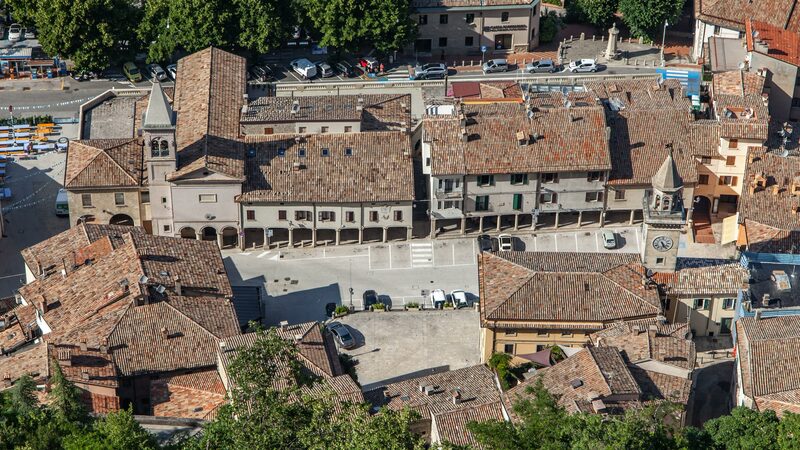 The other reason you may have heard of San Marino is for its old Grand Prix, but given the hilly landscape and little space in the country, the San Marino GP actually took place in the Italian town of Imola. I’ve said it a few times in this post, but the vantage point of Monte Titano provides some truly spectacular views. 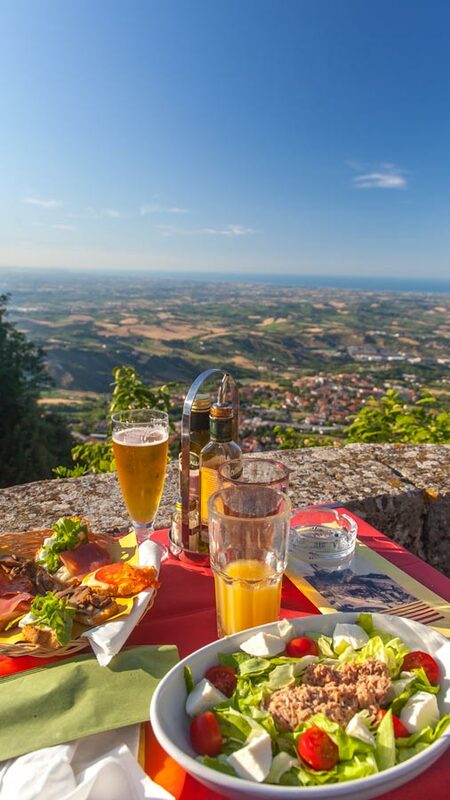 If you are lucky enough to visit on a clear day, looking out at Italy around you and the ocean in the distance is the perfect romantic spot for an impressive dinner or simply to capture some gorgeous holiday snaps. 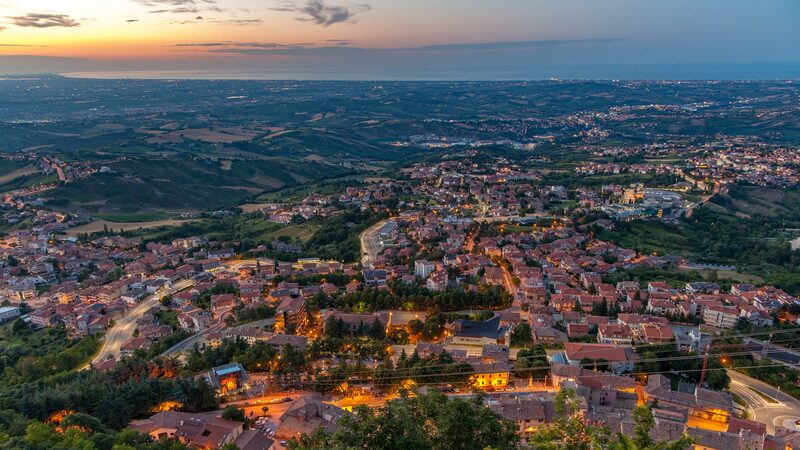 And then once you have visited this stunning country, be sure to explore all of the amazing towns in Emilia Romagna next, it might not be as famous as other regions such as Tuscany but it is packed with some of Europe’s best hidden gems and an incredible food scene, enjoy! 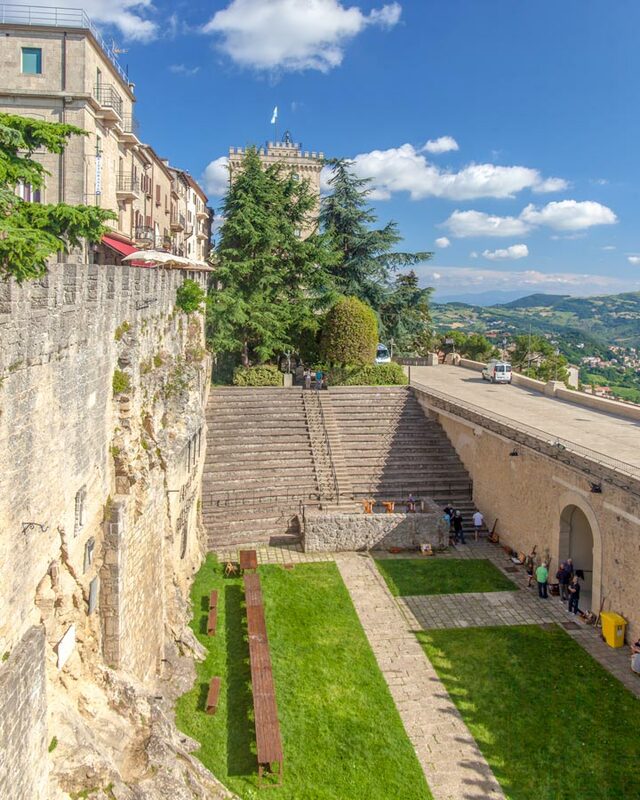 *I visited Emilia Romagna and San Marino as part of the Blogville project where content creators are supplied accommodation and are then free to create their own plans and itinerary while in the region. Best pictures are there in your blog.Really wonderful…. Good to see wonderful snapshot and San Marino day trip over night. So beautiful. I never heart of it, but now it is on my bucket list. Such a cute old town! Wow beautiful video i enjoyed that so much..have a beautiful views.. I hope you got lot of happy moments in San Marino.. Thanks for sharing. 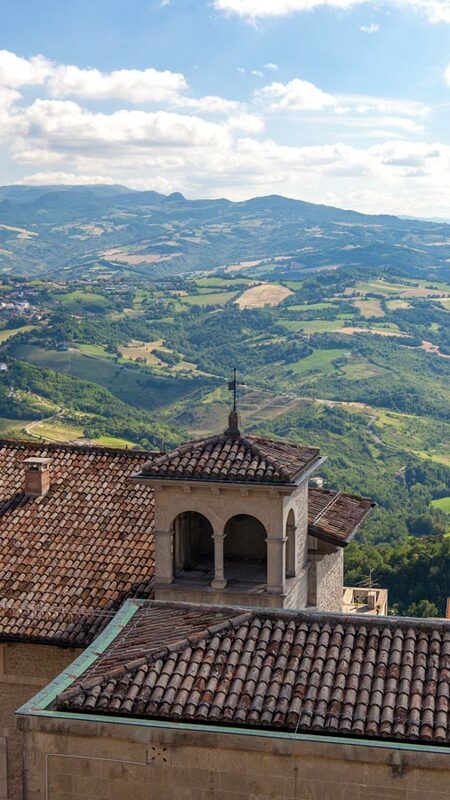 Planning a trip to Italy atm and thinking of doing a short detour to San Marino. How crammed are these streets of the old town during the day? Have been receiving some mixed messages on this topic. When I was there in June they weren’t too busy. I think it really depends on if/how many cruise ships have come into Rimini on the day. Outside of the main summer months, I have heard it is not too busy. You have the best pictures on your blog. Really impressive! !